The analysis of Donald Trump will be done based on the Secondary Progression method. The combined chart as of June 14, 2018. The inner chart is the natal chart, middle is the progressed chart and outer chart is the transit chart. The charts are cast as of June 14, 2018 at 12 noon for the birth place. 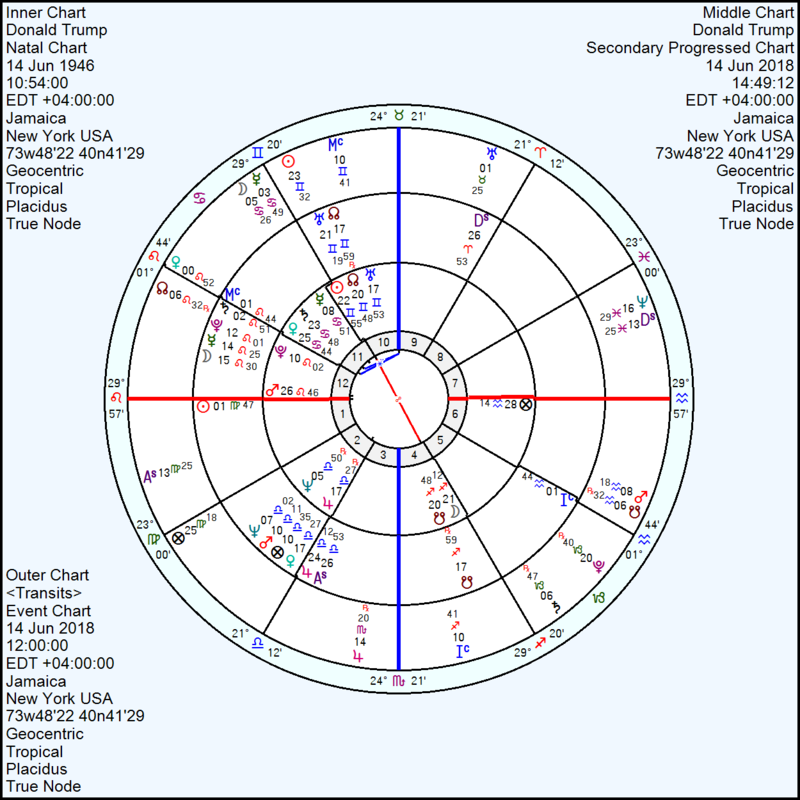 In the progressed chart the Progressed Ascendant, Moon, Sun and MC (10th house) depicts the nature of upcoming events for the next one year. In the above chart the Progressed Asc is at 26 Libra 53. It has square (malefic) aspect to natal Venus in 25 Cancer 44 and Sextile (benefic) aspect to natal Mars in 26 Leo 46. Since, the Progressed Asc is not activated by any transit planets the aspects between the Progressed Asc with natal planets will not happen. However, the Progressed Asc is on the Critical degree. This is not a good. The Progressed Moon is at 15 Leo 30. It is quincunx (malefic) aspect to transit Neptune in 16 Pisces 29. We all know the pact signed between Trump and Kim on June 12, 2018 and it is not getting implemented as agreed upon. The Progressed MC is just on the cusp of 12th house and will enter the 12th house. This will be a serious challenge for him professionally. It is square (malefic) transit Uranus in 01 Taurus 25. The progressed Sun is in 01 Virgo 47 and it has just entered the natal 1st house. It is Trine (benefic) aspect transit Uranus.